Convince a mourning mother to go to the local temple. Retrieve Roggvir's amulet of Talos. Return the amulet to Greta. 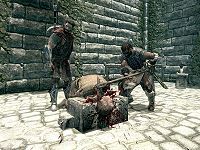 When first entering Solitude, you will witness the execution of Roggvir, the guard that allowed Ulfric Stormcloak to escape Solitude after murdering High King Torygg. During this, a child named Svari is being sent home by her father to spare her from seeing her uncle's execution. Svari can always be found in the streets of Solitude between 10am and 8pm when she plays with the other children. Approach her and she will appear quite sad about recent events, specifically with her uncle. When you tell her you are sorry about what happened with Roggvir, she will respond: "Thanks. Papa talks about it some. Mum doesn't say much since Uncle Roggvir died. She doesn't even go to Temple anymore. I wish she would. At least that way she'd have people to talk to." When you offer to talk to her mother, Svari will encourage you to do it right away and the quest will initiate. Svari's mother Greta can usually be found in the family house across the street from the Bards College or browsing the market between 3pm and 6pm. Approaching her will reveal that she is both bitter and sad about the execution of her brother. When confronted with Svari's concerns, she will respond: "She did, did she? She's going to get a sit down later." When you tell her that Svari just wants to see her mother return to the temple, she will explain her Nord beliefs: "Well. I wish it were that simple. Maybe it is. Look, I want to go back but I won't feel right in there without a tie to Talos. My brother Roggvir wore a symbol of Talos. He kept it hidden on his person. If I had that... I can't go near his body. Would you get it back for me?" Agree to help her and the quest will update and a map marker will point you towards the body of Roggvir. If you started the quest within three days after entering Solitude, Roggvir's headless body will still lie behind the chopping block where he met his demise. If not, his body will be inside the Solitude Catacombs behind the Hall of the Dead. Enter the catacombs and fight the skeleton then locate Roggvir's coffin near the entrance. Pry it open and claim the Amulet of Talos then exit the catacombs. Locate Greta who will cheer up a bit when you hand her the amulet: "Thanks so much. I'll return to temple. Here's something for your time and effort." She will then hand you a reward and the quest will end. From this point forward, Greta will enter the Temple of the Divines every morning at 6am for nine hours of praying, holding her forbidden Amulet of Talos. If you carry another Amulet of Talos in your inventory, the game identifies them all as quest items. You will have to choose the dialogue option before you can drop, sell, or build with any Amulet of Talos. If you wait to loot the Amulet of Talos from Roggvir's corpse until you receive the quest, when you offer to give an amulet to Greta, it does not complete the quest, gain a reward, nor does it remove an Amulet of Talos. The dialogue option disappears nevertheless and the amulet(s) are dropable/sellable. If you loot the amulet from Roggvir's corpse before talking to Greta, the same problems occur as above. The dialogue option disappears, but not the quest journal entry. It also makes the amulet(s) dropable/sellable. A solution is to proceed to talk to Svari, then talk to Greta. Mention going to temple, and after she asks you to retrieve the amulet, exit the conversation. Do not choose the "Actually I've got it here" option. Now in the console, type setStage SolitudeFreeform03 20, this will set the quest to the moment you are supposed to retrieve the amulet. Since you already have it, go into the console once more and type setStage SolitudeFreeform03 30 which will set the moment you should have picked the amulet up. Return to Greta and give the amulet. It will complete the quest and will be removed from the log, though the amulet still stays in your inventory and you won't get the reward she mentions. Another solution is, before talking to Greta (or in some cases Svari), to use the console command player.drop 000CC846 x (with x being the number of Amulets of Talos you have in your inventory +1) in order to drop all Amulets of Talos. No matter how many you have, one of it (the one relevant for the quest) will always drop separately. After talking to Greta and promising her to retrieve the amulet, just pick up all the amulets you've dropped and talk to her to finish the quest (you might get a leveled reward and complete the quest using this method). If you end up with two Amulet of Talos in your inventory, you could try the console command, player.removeitem 000CC846 1 to eliminate the duplication. When you offer Greta the amulet, sometimes she doesn't take the amulet or give you the reward, but the quest is completed. Greta's disposition towards you does not increase after completing the quest as it should. Objective 10: Speak to Greta about going to the Temple of Divines. Objective 20: Retrieve Amulet of Talos off of Roggvir. Objective 30: Return Amulet of Talos to Greta. On the PC, it is possible to use the console to advance through the quest by entering setstage SolitudeFreeform03 stage, where stage is the number of the stage you wish to complete. It is not possible to un-complete (i.e. go back) quest stages, but it is possible to clear all stages of the quest using resetquest SolitudeFreeform03. This page was last modified on 24 January 2019, at 23:14.